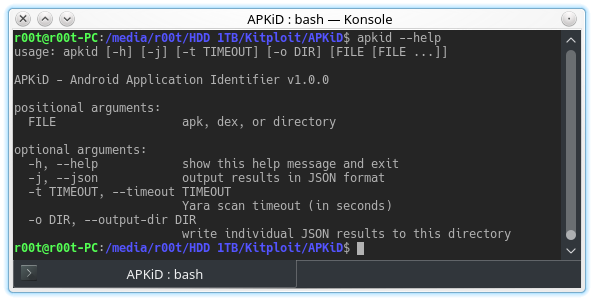 APKiD gives you information about how an APK was made. It identifies many compilers, packers, obfuscators, and other weird stuff. It's PEiD for Android. The yara-python clone and compile steps here are temporarily necessary because we must point directly to our modified version of a Yara branch which includes our DEX Yara module. This step is nessecary until (if?) the original maintainers of Yara merge our module into the master branch. When this happens, we will undate the instructions here. After the yara-python fork is compiled, you can use pip to the most currently published APKiD package. We are open to any type of concept you might have for "something interesting" to detect, so do not limit yourself solely to packers, compilers or obfuscators. If there is an interesting anti disassembler, anti vm, anti* trick, please make an issue. You're also welcome to submit pull requests. Just be sure to include a file hash so we can check the rule.